Is the EcoTech Marine VorTech QuietDrive flow pump for you? Reef Hacks files a hands-on review here. First, VorTech took the pump motor out of the aquarium, now QuietDrive takes the noise out of the motor. The Vortech MP10 has been upgrade to the new QuietDrive driver that reduces noise, improves efficiency and increases flow. The VorTech is no less amazing today than when it was first revolutionized the aquarium hobby. 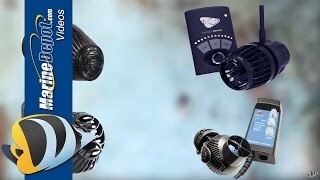 Three generation of pumps, over a decade of flow production, and tens of thousands of healthy aquariums are a testament to this uniquely designed powerhead. In an aquarium, having the right amount of flow is crucial to the health of the ecosystem. With VorTech QuietDrive, choosing the correct water circulation equipment has never been easier. VorTech pumps are designed by aquarists to be the gold standard in providing flow in marine aquariums. When it comes to broad yet gentle flow, the VorTech design is unmatched. At the heart of the VorTech`s success is its unique, patented, magnetically coupled design. QuietDrive builds on the unique advantages of the VorTech`s magnetically couple design and takes it to the next level. The revolutionary new drive system boasts increased efficiency and significantly reduces motor noise. Reef Crest Randon Mode simulates a high-energy reef environment. The pump will change speed frequently and drastically to simulate crashing waves and surge tide. This is a favorite of SPS Corals. Short Pulse Mode creates a flow pattern consisting of uniform high and low flow levels pulsing at a selected interval between 0.2 seconds and two seconds. Nutrient Transport Mode (NTM) creates circulation in a two-phase program. The first phase uses wave motion to stir up detritus. The second phase follows with a surging motion to move the detritus into the overflow and out of the aquarium. This mode promotes maximum health, nutrient export and increased growth for sensitive corals such as SPS. Pumps can be enabled to run a gentler night time program simulating calmer ocean conditions for the night time hours. Blizzard, hurricane, a downed utility pole; stuff happens. 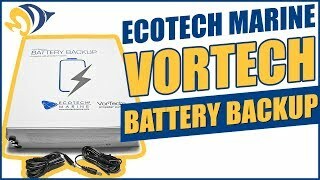 The power goes out... VorTech pumps are compatible with the EcoTech Battery Backup accessory. Reduced motor noise compared to older MP10ES. 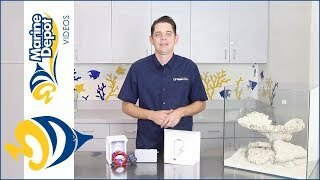 Clearance Needed Behind Aquarium: 2.25"
Use our chemistry calculator to find out how many VorTech pumps they will need to provide adequate flow for SPS and LPS corals. This is a gray power head, love not having cables running through the tank. Can barely tell it is there. Mounting equipment is all great. Variety of setting is also awesome. using Lagoon mode on 25 gallon IM Lagoon. Corals love it. I love this pump! It’s very user friendly and my corals seem to like the varying flow it produces. Another amazing product from Ecotech. These pumps are fantastic and I couldn't be any happier. I did not opt for the Wireless model, as it's not needed right now. If I end up wanting that feature, it's an easy install.